Abdominal massage is a technique that has been used by multiple cultures since the time of the ancients. Palpating the belly has been thought to promote health and wellness in many ways, including pain relief, stress relief, and overall improvement of the functioning of the digestive tract. Abdominal massage doesn’t require a lot of hard work, and it’s easy to incorporate it into your daily life in order to facilitate lifelong wellness of both the body and the mind. The methodology behind abdominal massage is surprisingly simple, and the many benefits that can be reaped from such an easy set of steps make it worth the five minutes the process takes out of each day. Dr. Stephen Chang is a medical doctor trained in the arts of both Western and Eastern medicine, and he has devised a quick and easy method for applying abdominal massage so that anyone can do it—in less than five minutes per day. Lie flat on your back on a firm bed or on a mat placed on the floor. Expose the belly by lifting your shirt, so you can get skin-to-skin contact with your tummy. Rub your hands against one another firmly until they feel very warm (about 15 seconds). Place your fingers into your navel and begin a firm (but not painful) rubbing motion, slowly circling outward from the navel. Focus your mind on the warmth building up in your abdominal area as you continue the motion, slowly making about 40 or 50 circles around your abdominal area, totaling two minutes in all. That’s it! You’ve just performed your first abdominal massage. Dr. Chang recommends that the two-minute abdominal massage be performed routinely twice per day, after waking and right before you go to sleep. Dr. Chang mentions that most people see noticeable results within 1 week of consistent practice. Abdominal massage produces many health benefits, and not all of them are limited to the tummy area. This process can heal momentary ailments such as constipation and bloating, and when performed regularly, abdominal massage can be a contributing factor to lifelong wellness. Further reading: Read my other related articles to help you lose weight: 12 simple tweaks for weight loss and great health, 9 secrets of losing weight without diet. If you suffer from belly fat, you can find more information on how lose your belly without counting calories or starving yourself in my e-book Blast Your Belly Fat. Bloated feelings often arise when our metabolism becomes impeded in some way. Performing abdominal massage can help to regulate metabolic function and reduce the build-up of wastes in the body (which contribute to bloating), leading to relief from uncomfortable bloating. Further reading: Read about the top 12 foods to beat bloating and flatten your stomach. According to a research published in the International Journal of Nursing Studies, abdominal massage can provide all-natural relief from troubling constipation and associated abdominal pain. By using daily abdominal massage, you can eliminate existing constipation and help prevent it from recurring. Further reading: Read about these natural remedies for constipation and the best natural laxatives. The tummy massage outlined by Dr. Chang can help with more transient woes like constipation and bloating, but regular utilization of the technique can also help with maintaining gastrointestinal health over the long term. By increasing stimulation of blood flow to the abdominal region and physically stimulating the intestines, you can help keep your digestive system running at peak efficiency by adding abdominal massage to your daily regimen. Further reading: Read about the 8 best natural methods to treat digestive problems and top 10 herbal teas that will work wonders on your digestion. Recent research published in the journal of Evidence-Based Complementary and Alternative Medicine showed that abdominal massage using aromatherapy oils (clove, cinnamon, lavender and rose) may help reduce painful menstrual cramps and lighten problematic heavy menstrual bleeding when performed during the week prior to expected menstruation. Try using a few drops of these essential oils mixed with a tablespoon of carrier oil when performing abdominal massage to see if this method helps you. You can find more information on how to use essential oils in my e-Book Magical Aromatherapy. The practice of abdominal massage can contribute not only to various aspects of physical wellness, but to psychological well-being too. Some people have found that abdominal massage, like many other forms of massage, provides peace of mind and relief from stress. After all, when you can eliminate physical ailments and make your body feel better, your mind is sure to follow suit! Pushing on those abdominal muscles twice per day can also help to improve abdominal muscle tone. That’s right – this relaxing and relieving massage could actually help tighten your tummy as well as providing a long list of accompanying health benefits. What have you got to lose except excess waste and excess weight? Further reading: For a more vigorous workout on your tummy muscles, check these 8 simple exercises to get flat tummy at home. As you can see, abdominal massage has many perks, and is so simple to do that even the busiest person can make it a part of his or her daily routine. Through regular practice, abdominal massage can quickly and easily become yet another way to incorporate natural healing methods into your life to help you stay happy and healthy over your entire life span. Whether you want relief from maladies like constipation, sluggish metabolic function or menstrual cramps, or you just want a simple way to incorporate natural, chemical-free healing into your life, abdominal massage is a fast and painless way to help you achieve your health and wellness goals. You can use reflexology to heal your entire body and you can find instructions in my article on how to use reflexology to treat common ailments. You can strengthen your back and prevent back pain by doing these 13 simple exercises. You can also get a flat tummy by doing these 8 exercises. Hi Tessa, some of the symptoms of gallstones include abdominal pain and cramps, tenderness or feeling of fullness or bloating in the abdomen, so doing an abdominal massage can aggravate these symptoms. does it matter if you massage clock-wise or counter clock-wise? right or left hand? I’ve seen references recommend to use a clockwise motion when massaging the belly as this follows the workings of the intestine. Other references say that to help stop diarrhea, you need to reverse the rubbing direction, i.e. rub in counterclockwise circles. You can use either hand for the massage. Hi Annette, You need to listen to your body – if you still feel any pain or tenderness in the area, then probably it will make sense to wait more time before having a belly massage. Abdominal massage….another good one from you….the two minute time could be increase, by the person, if he/she wishes…. 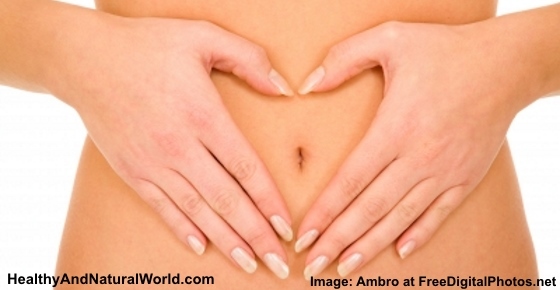 Abdominal massage has really helped me with my IBS (Irritable Bowel Syndrome) pain. Thank you for such an amazing article Jenny!